The Peking edition of the Kangyur is held in the National Library of Mongolia is printed with red ink. The folio size is approximately 28 inch x 8.3 inch (71.7 cm. x 21.2 cm). Yuishoji Buddhist Cultural Exchange Research Institute (YBCERI) . 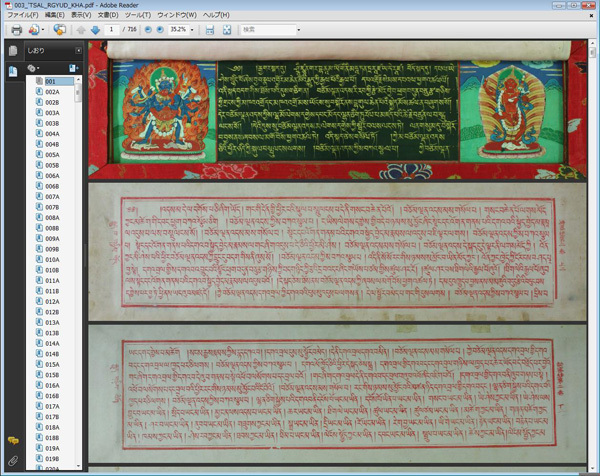 Included in this complete digital version are 103 volumes from the National Library of Mongolia and 4 volumes (002 rgyud ka, 018 rgyud tsa, 048 sher phyin mi, 066 mdo sna tshogs ngu) from the Harvard-Yenching Library. And a few mising pages from some volumes are also supplemented the from the Harvard-Yenching Library. And 2 volumes(038 sher phyin chi, 039 sher phyin ji) from the National Library of Ulaanbaatar has several overwritings and additional copies of these two volumes are added from the Harvard-Yenching Library are included for reference. Approximate size of the page 27 inch x 7.5 inch (68.58 cm x 19.05 cm).